Dental implants are the longest-lasting and most natural looking/functioning solution for replacing missing teeth. Unfortunately, the cost to have implants placed can be quite prohibitive since a single implant can cost thousands of dollars. Luckily, there are few ways in which a patient can obtain implants at a more affordable price. To find the best rates, patients should get quotes from several dentists, asking for a comprehensive breakdown of the fees and estimated total cost of the necessary consultations, imaging (x-rays or CT scans), anesthesia, modeling, surgery, materials (post, abutment and crown) as well as any additional procedures such as sinus lifts and bone grafts. Dentists are not the only dental professionals that can be certified to perform implant procedures, so patients can get quotes from other qualified professionals including periodontists and oral surgeons. Selecting a newer dental practice may help reduce the price as a dentist who is looking to build a clientele and gain experience may charge less than a more established dentist. That said, be sure you know what to look for when you’re trying to find a good dentist. 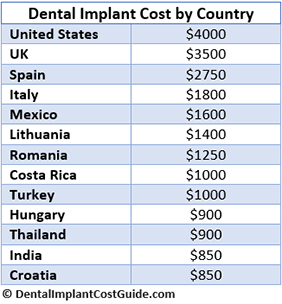 The cost of dental implants can vary quite significantly geographically, so patients can find savings by considering a larger geographic area. This is especially true for patients in larger cities. Dentists in urban centers generally have a higher cost of living and higher overhead costs than those in smaller towns and as a result, are more likely to quote higher prices. Taking the search a step further, dental tourism has become a popular option for those searching for low cost dental implants. Developing countries such as Mexico, Costa Rica, Hungary and many Asian destinations offer treatment for a fraction of the price patients can expect to pay in developed countries like the United States, Canada and the UK. This is especially useful for less severe cases in which a patient is a candidate for simultaneous implant and crown placement. While the savings can be impressive, dental tourism should be approached with caution. The licensing standards and regulations of the country in question as well as the credentials and reputation of the prospective dentist should be carefully researched. For more information on traveling for treatment, check out the Complete Guide to Dental Treatment Abroad which covers some of the most popular countries, the benefits & risks as well as interviews with dentists and patients. Another option is to take part in a dental implant clinic/program held at a school of dentistry. These programs provide recently graduated dentistry school students looking to gain hands-on experience with the opportunity to perform dental implant procedures with the assistance and supervision of experienced dentists or dental surgeons. Some schools only offer this service to low income individuals – and don’t be surprised if you’re placed on a wait list. The work can take a long time (multiple visits), and the hours can be inconvenient (during working hours), but if you qualify, the wait is well worth the thousands of dollars you’ll save. The work is typically very good quality since work done at a dental school includes quite a bit of oversight. Each diagnosis and treatment is analyzed and discussed by several students and professors. They provide the same quality treatment as professionals for a fraction of the cost since they’ve studied and practiced the procedures on models. At the very least, these clinics are a great place to go for a second opinion. An interview I did with John who went to the Columbia University College of Dental Medicine. A.T. Still University School of Dentistry & Oral Health (Read Diana’s comment). And here is a list of all the schools that offer services to the public. Some dental societies and non-profit charitable organizations offer free or discounted care for low income patients, often during planned events. There are also associations that provide free care for patients in specific demographic groups, such as victims of domestic violence, people with disabilities, women and children. The American Dental Association lists both state and county dental associations in its online directory. There are companies such as Care Credit that finance dental work, allowing a patient to receive implants and make monthly payments along with the applicable fees and interest. The main requirement to qualify for the loan is a decent credit score. Since they are the longest-lasting restoration option and typically do not require continuing dental work in the future, financing the cost (despite fees and interest) can be a great way to afford implants. Discount dental plans are a membership-based plans in which patients pay yearly or monthly fees in order to receive discounts on dental care, ranging from 10% to 60%. Patients participating in these plans are generally required to use only affiliated dentists within the plan’s network, but the discounts can potentially take hundreds, if not thousands of dollars off of the total cost of an implant procedure. Find out how one of our readers saved $3300 on his implants thanks to a dental discount plan. Bridges and partial dentures are the main alternatives to dental implants for replacing missing or extracted teeth. This is especially the case if there are still viable abutment teeth to support a bridge crown. They do not usually last as long as implants, but dental bridges can last an average of 15 years if they are properly cared for. Bridges are bonded to the abutment teeth so they do not need to be removed for cleaning like partial and full-mouth dentures. 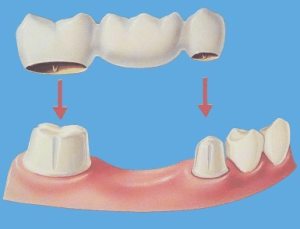 The drawback of a dental bridge is that the bone in the jaw supporting it under the artificial teeth will atrophy over time, eventually causing failure of the crown and bridge. Most dental insurance carriers do not cover implants because it is considered a cosmetic procedure, but company policies continue to change. Some dental insurance providers are starting to offer to pay up to the cost of similar, but less expensive procedure such as bridge or partial dentures. Insurance coverage will usually include procedures that restore functions that are compromised by the pain caused by missing teeth. If dental implants are the only procedure that can bring your oral health back to normal, then your insurance will probably cover at least a portion of it. If you’ve tried all of the options above and found that they aren’t available in your area, don’t make the procedure affordable enough or that you’re ineligible, then you should consider starting a campaign to raise the funds using a website such as Indiegogo.com or GoFundMe.com. These services are similar to Kickstarter – the most well-known crowdfunding service – but they will allow you to raise money for a personal health matter. Once you’ve setup a page and written an honest and detailed explanation of your situation (and maybe even created a video), you can send a link to your family, friends, co-workers, local churches and any online communities you’re a part of asking them to donate towards the cost of the dental work. Make sure that you outline how your new teeth will positively impact your life (and possibly the lives of your family) as well as exactly how the money will be spent. Asking other people for money isn’t for everyone – especially when it is for a personal health issue. If this approach would make your or a member of your family embarrassed/uncomfortable, then it might not be a good idea. It isn’t advisable to pressure people, beg or ask multiple times for money. Before asking somebody, ask yourself: If this person asked me for money, would I donate to their cause? Which of these methods did you use to save money? How much did you pay for your treatment? Leave a comment and let us know! Please help me find someone who can do the mini dental implants or all on 4 or snap on dentures. I have insurance through medicare and I also have a discount plan through careington dental. I would really love to have a nice smile and be able to eat normally and enjoy what I eat. I don’t have much money so please help if you can. Hi Rhonda. I, too, have Sjogrens autoimmune disease. I once had beautiful teeth. The disease has destroyed my teeth. I’ve had 10 pulled (very expensive) & need all of them removed. I would love to have the money to have the rest removed & get dentures. I have been told that with Sjogrens, we need the mini dental implants in order to retain the dentures because of our dry mouth. I’ve been to the only dental college in my state & told I needed to pay 30% upfront & the remainder in 12 monthly payments which would be almost what my house payment is. There is no way. Good luck & don’t give up. We’ll eventually figure this out with the Lord’s help. It’s pretty sad so many people come here begging for handouts. I am currently in the 6 week healing process before getting dentures so I have no teeth right now. Before they were pulled they were terrible. To get the work on my mouth done I hunted down resources on the internet and followed up on them until I got the help I needed. I darn sure didn’t jump on comment forums begging for help. There is help out there, quit being lazy and find it and stop counting on strangers generosity to do the footwork for you. Mike, It took me three years to save to have the dental work done. I am on disability, but found ways to cut things out to afford the dental care I needed. I am 3 months post teeth removal, and have temporary dentures in. I was on a waiting list for two years for my state, but knew the list was long so from the beggining I put money away each month. I can’t get use to the dentures, I gag when they are in. After spending over $5,000.00, I don’t know what else I can do. I am trying to increase the time in every few days. I guess my next step will be mini implants. It will be another year and a half before I can afford those. It’s scary having a epilepsy and having swallowed my partial, so that might be part of it. I found if I cut out my smart phone, cut out everything but basic cable. Sold items on eBay. I bought my children’s clothes at a thrift shop, a kept to a tight food budget I was able to save each month. It wasn’t easy, but it was worth it. I also went to a dental school. You must stick with the program and not miss an appointment without a 24 hour notice or you are removed from their program. It seems like too many are looking for others to do the work for them. I have taken advantage of mobile dental programs for my three kids so I don’t have huge dental expenses for them. Times are really rough for almost everyone these days, so it is important that we look within ourselves to get what we need or want. I am sorry you have had problems like the rest of us & pray for healing & recovery. I, in no way am begging for handouts from anyone. I appreciate the comments & feel comforted with the empathy for & from others in the same situation as we are in. It would be nice if you could post & share helpful websites & resources you’ve found helpful. Peace. I’m 53, a widow with a handicapped child, I got breast cancer last year and have been going thru the agonies of the damned since then. I smoked cigarettes for way too long, tho I quit 2 years before I got the cancer. The smoking messed up my gums. I got free full dentures thru the 18 month cancer medi-cal program (they took 7 teeth pre chemo, and are removing my post chemo 11 remaining teeth on Monday) and I am opting for the 3M Denture Attatchment System, which is supposed to cost between $2,800 and $5,000. They are “mini implants”. With a large-ish down payment and the payment plan offered, I should be able to pay them off within the first year. I will let you all know how this works out for me..oh yeah, I’m cancer free so far. Yay! Thank you for mentioning mini dental implants (MDI), I should add them to this page as another way to save some money while enjoying similar benefits to those that regular implants provide. For those who don’t know, mini implants are a great alternative for those who don’t have enough bone to secure full sized implants or are looking for a lower cost dental prosthesis that is stable and low maintenance. MDI are a fraction of the cost and the minimally invasive procedure makes the recovery time shorter as well. I’m adding an article about mini implants to the site soon and I’d love to add your thoughts and experience to it. Please let me know if this is something you’d like to contribute to. Good luck with everything and please update us on how things go when you can!